When a part the spine and nervous system is under-working, then the muscles, ligaments or tendons in that area function less effectively. If there is lack of support or strength we often compensate in other areas. This can lead to overuse or underuse, resulting in ongoing soft tissue injuries and under performance. Longstanding or recurring sports injuries signify a problem in your body mechanics. When a part the spine and nervous system is under-working, then the muscles, ligaments or tendons in that area function less effectively. If there is lack of support or strength we often compensate in other areas. This can lead to overuse or underuse, resulting in ongoing soft tissue injuries and under performance. BodyEvolve has helped many athletes to keep training in peak fitness. Not only do we help deal with injuries when they occur, but also PREVENT them happening in the first place! Chiropractic, sports therapy and massage is provided for our clients at BodyEvolve, to help recover from injuries, to reach fitness goals for competitions or to succeed in personal bests. We see many semi-pro and professional athletes at BodyEvolve. We work with UK Professional Boxers and one of the countries leading Sports Conditioning and Nutrition Coach. Ron Grabner, 64, is one of our legend star performers. 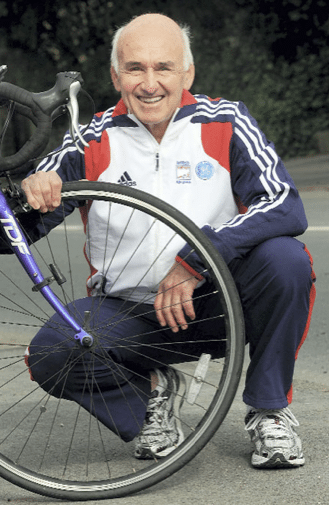 He recently came 6th in the World Triathlon Championships in Beijing, over 60’s category. Age is no barrier, as Ron is now in training for next year’s European and World Championships. Go Ronny!